I posted yesterday about Pantone's 2015 Color of the Year - Marsala. 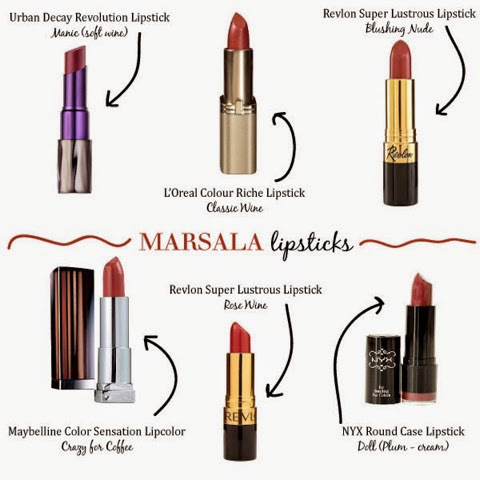 While I've not tried any of these yet, this list will help me know what to look for when I make my next trip to Ulta. :) Then I'll test in the store to make sure it looks okay on my skin. HI dear, i like this color.. I've decided that when I turn thirty I should start wearing lipstick. I've seen pictures of myself lately where I seem to have no lips. It's not cute. Perhaps you can help me pick a shade. Here's what I've decided... nothing too bright, too dark or too pink.